Colorado’s Western Slope experienced somewhat of a landslide on Super Tuesday as Democratic caucus-goers came out in force for far left-leaning social Democrat Bernie Sanders. Anger continued to carry the day on the Republican side as no official presidential preference vote was taken. Summit County Commissioner Dan Gibbs speaks at Tuesday’s Democratic caucus at the Summit County Senior Center. “There were some people who were really pissed when they got there and they expected there to be a specific opportunity to express their candidate of choice, and that really didn’t happen,” said Eagle County Republican Party precinct captain Randy Milhoan, a former chair of the local GOP. Because of changes in national GOP rules binding delegates to a candidate if an official straw vote was taken, the state Republican party opted not to make its choice official at its caucus, leaving the state party free at the national convention. Of course, if not enough delegates back one candidate after the first vote at the Republican National Convention in Cleveland in July, delegates are then freed up to vote for any of the remaining candidates anyway. Still, even though Donald Trump appears to be a runaway frontrunner, forces are aligning to ensure an open convention, so the Colorado GOP keeping its options open for the first round of voting might not be the blunder some say it is. Milhoan said that between 300 and 400 Republicans showed up at Battle Mountain High School on Tuesday night, representing the vast majority of the precincts in the county (the far-flung McCoy-Bond and Basalt-El Jebel areas held separate caucuses). Toward the end of the evening an unofficial poll was taken, with caucus-goers raising their hands to indicate preference. Milhoan, who personally went for Texas Sen. Ted Cruz, said the majority of the room preferred Florida Sen. Marco Rubio, followed by billionaire real estate tycoon and reality TV star Trump, then Cruz and Ohio Gov. John Kasich. Neurosurgeon Ben Carson, who just dropped out of the race on Wednesday, had two hands raised for him in Edwards. Democrats, who did take an official preference poll, met all over the county, with an estimated 160 Dems gathering at the Eagle County Paramedic Service building in Edwards. A party official said the vote went 95 to Vermont Sen. Sanders and 70 to former First Lady, Secretary of State and New York Sen. Hillary Clinton. Overall, Eagle County backed Sanders 623 to 344. Edwards precinct captain Debbie Marquez, a Sanders supporter, said “many of the same people in 2008 were there for Hillary [Tuesday night] and people waiting to support Clinton this time around,” but she’s afraid the high-energy youth vote for Sanders in 2016 won’t back Clinton if she’s nominated, which looks more and more likely after her victories on Tuesday. Marquez said Sanders voters are backing an anti-establishment movement, and Clinton represents the establishment. She added that the Hispanic vote will likely support either Democratic nominee because of the outright racial bias of the Republican Party in general, not just the blatant racism of Trump. 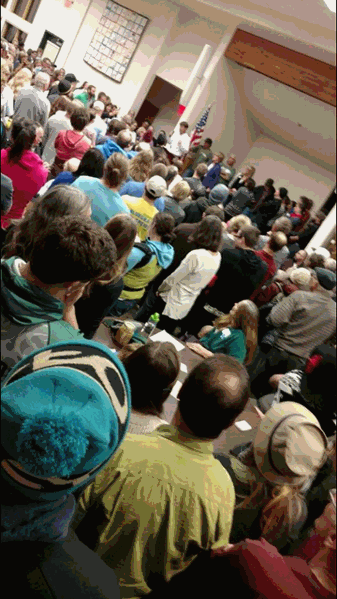 In neighboring Summit County, where Sanders prevailed 419 to 276, former state lawmaker and current county commissioner Dan Gibbs estimated 600 Democrats showed up at the Summit County Senior Center – the county’s only Democratic caucus site. “There’s a lot of passion for Hillary and a lot of passion for Bernie, but a lot of people I spoke to [Tuesday night] said we cannot let this guy win, we cannot let Donald Trump win,” said Gibbs, who was selected for the county assembly as a delegate for Clinton. Gibbs appreciates the energy for Sanders but wants to see it carry over into the general election if Clinton is nominated. “After seeing last night’s crowds, I’ve never been more optimistic that Coloradans will ensure that our Democratic nominee will be the next president of the United States; we will reelect Sen. Michael Bennet, regain our Democratic majority in the state senate and increase the numbers of elected Democrats across our state,” Colorado Democratic Party Chairman Rick Palacio said. Sanders won Colorado overall on Tuesday, although, depending on how delegates are counted, even that victory is in question. But Colorado was one of only four states he won (including his home state of Vermont) compared to seven for Clinton. Bruce Butler, the Republican mayor or Silverthorne, estimated 250 GOP caucus-goers showed up at Summit County’s only Republican caucus site, the Silverthorne Pavilion. An unofficial vote there went to Rubio, with Trump second and Cruz third, he said, adding there was a lot of confusion about how a caucus works, especially from many of the new attendees. “A lot of people didn’t understand if the straw poll was binding or not binding,” Butler said, although he added it was not the main topic of discussion, which mainly focused on the attributes of the remaining candidates.